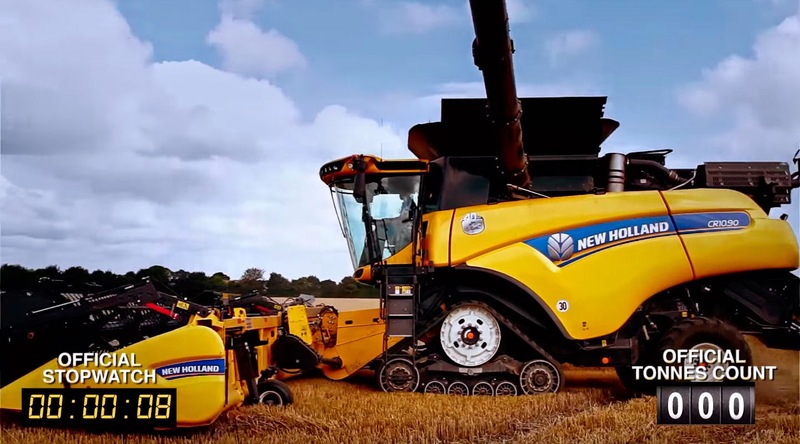 A few weeks ago, while we were surfing in YouTube we found the video that you can find below... the news was really interesting for us: New Holland gets back the Guinness World Records to harvest almost 800ton of wheat in only 8 hours using the CR10.90 combine and five T7 tractors with 14 ton trailers each one, so it overcomes the previous record of 120ton. 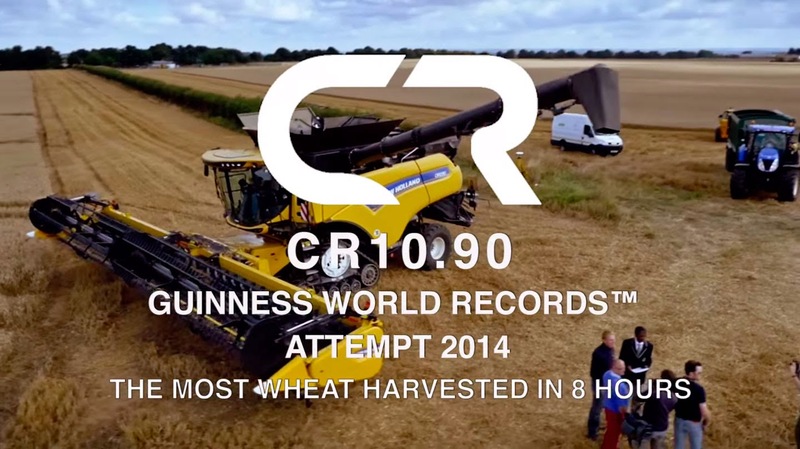 This record demonstrates the high performances of the CR10.90 combine because the previous record was got at 675.84ton what was broken in just ​6​ hours and 36 minutes. 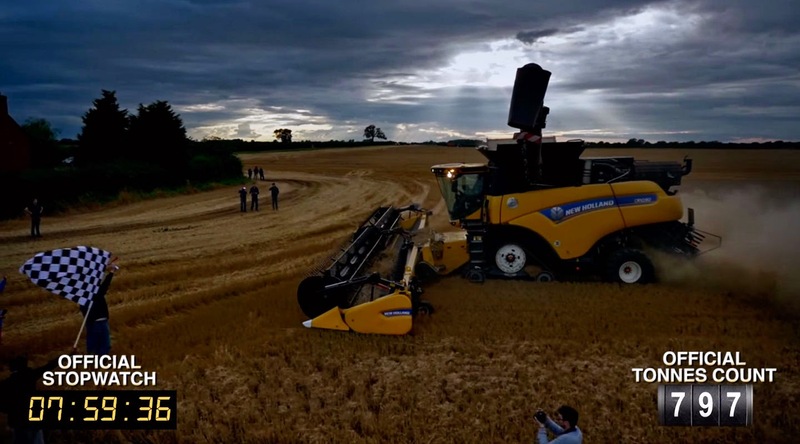 The Guinness World Record was registered on the 15th August of 2014 in HR Bourn and Sons field, in ​​Grange de Lings near ​​Wragby Farm, ​​Lincolnshire, United Kingdom. 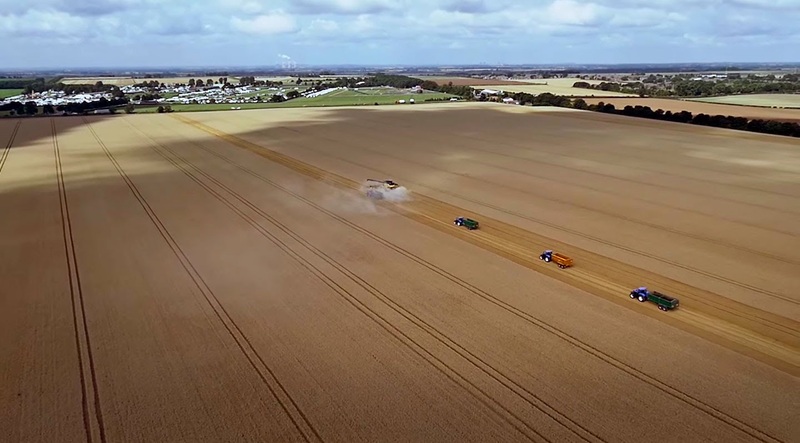 The field was sowed with Santiago wheat variety in the autumn of 2013, this task was performed before this field was chosen (in May of 2014) to hold this event, so there were real crop conditions. 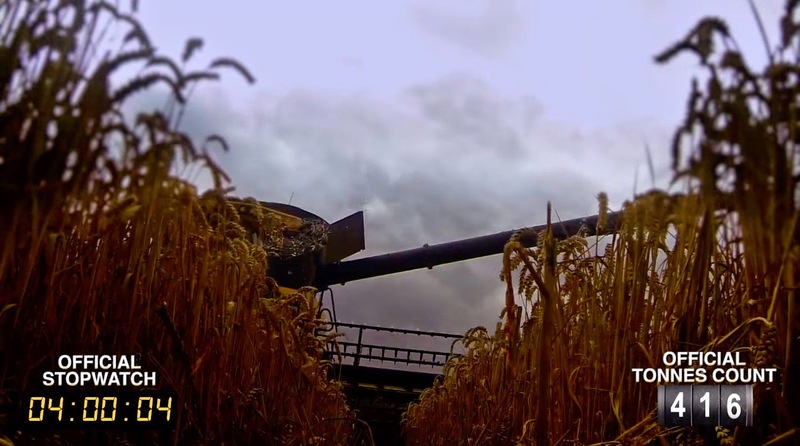 On that day, harvesting tasks began at 11:17 a.m. and the weather was overcast with a few rain showers after 17:30 and the temperature was 18-21 ºC. 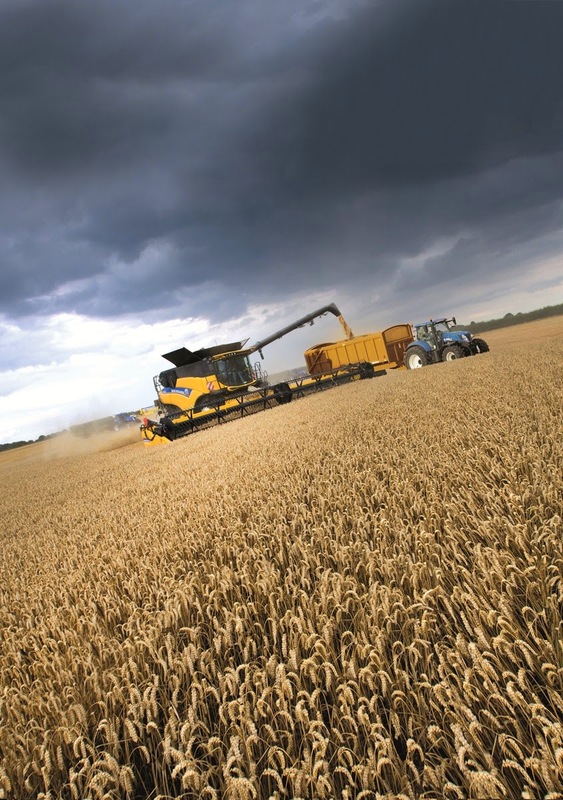 The average production of the CR10.90 was 99.7 ton per hour (the maximum peak was 135 ton/h) and the average yield was 9.95 ton per hectare and the average moisture was 16.2%. 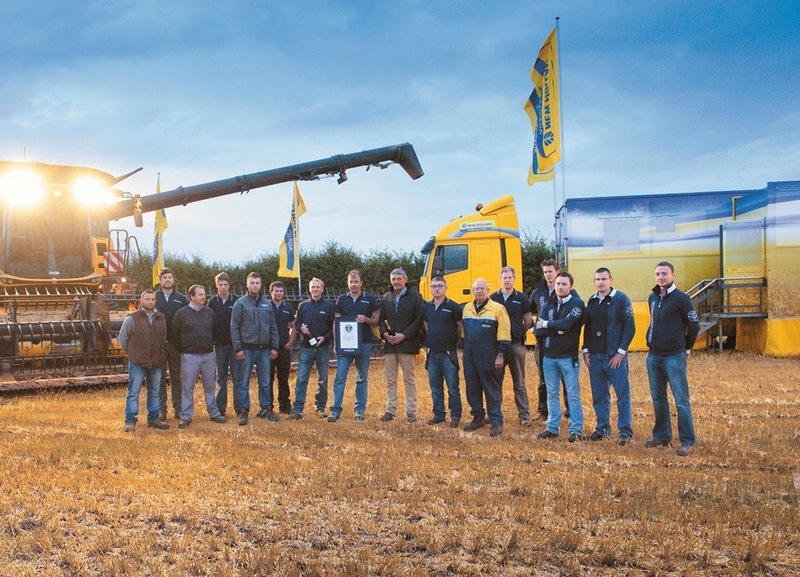 This Guinness World Record was only gotten with a diesel consumption of 1.12 litres per tonne (we have to highlight the chopper was working whole day). 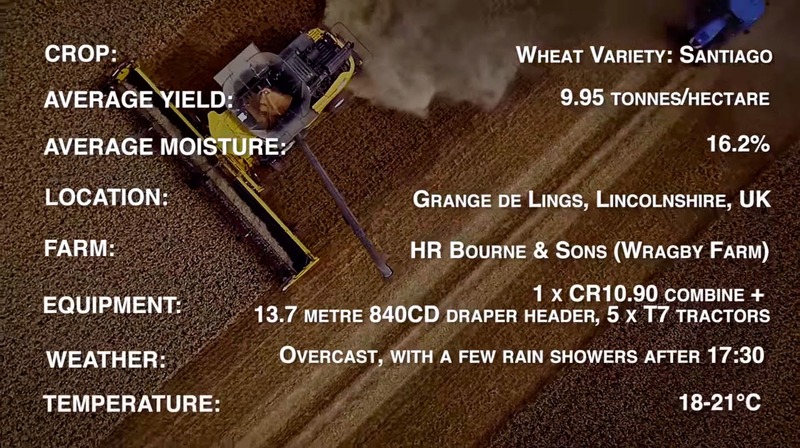 The CR10.90 combine is equipped with the Twin Rotor® technology and the DFR (Dynamic Feed Roll™) system. 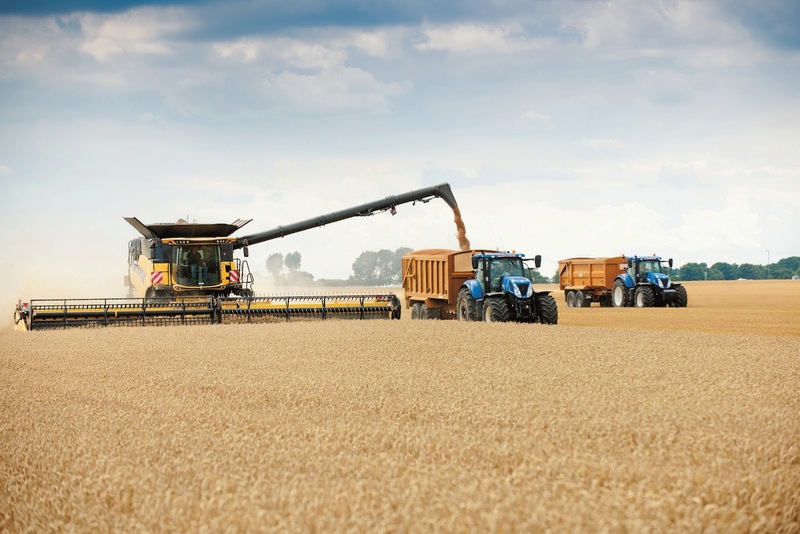 It uses a Cursor 16 engine of 653HP (Tier 4B regulations) with ECOBlue™ HI-eSCR technology. Also, it is equipped with the SmartTrax™ rubber tracks and Terraglide™ suspension system. 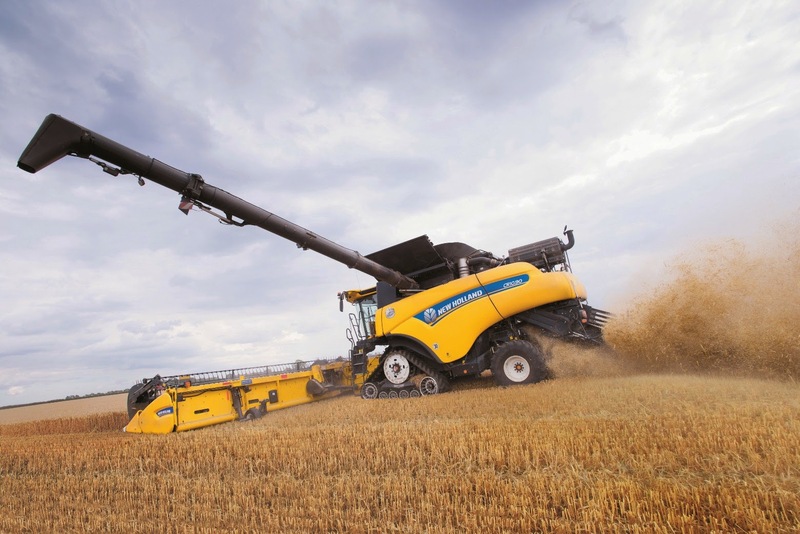 It has an extra-long folding unloading tube of 10 meters and the unloading speed is of 142 l/s. 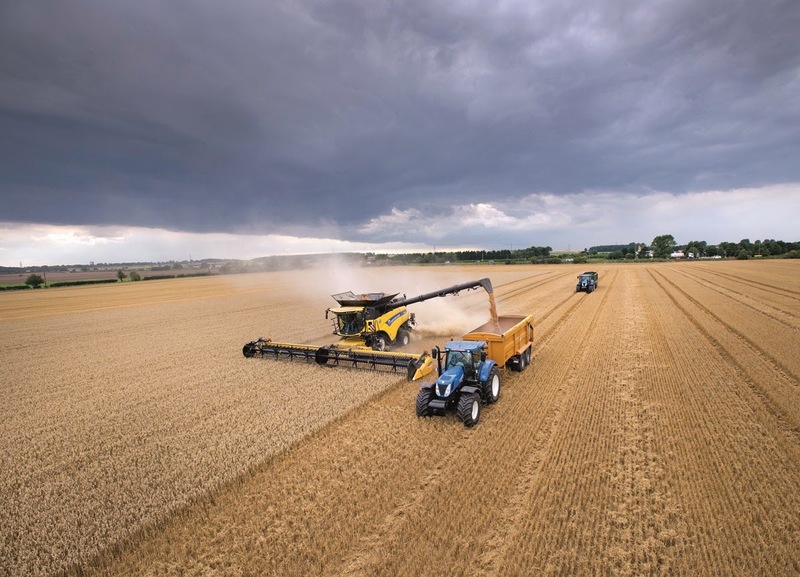 The driver (from the exclusive Harvest Suite Ultra cab) worked with the IntelliSteer™ automatic guidance system and it allowed them to optimize the 840CD cutterbar (cutting width of 13.7 meters) throughout the entire working day. 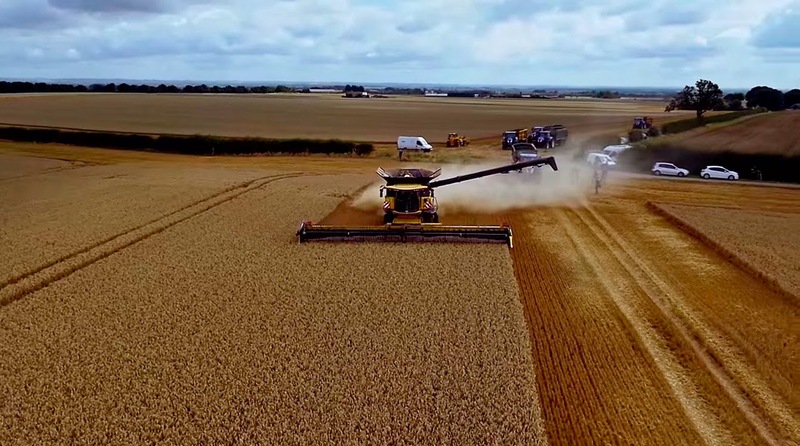 1 x CR10.90 combine with 45ft (13.7 m) 840 CD draper header. Ay que ver lo que hacemos los herreros. 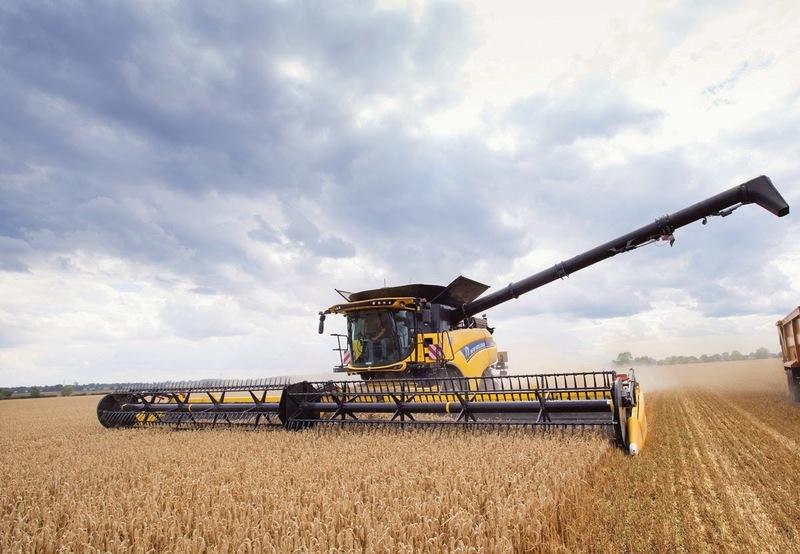 A partir del día 7 de enero nos pondremos con la Claas y voveremos a batir el record, pero lo bueno será cuando nos pongamos con la IASA entonces esos, si que se van a enterar. Muchas gracias por tu comentario.... esperamos esas fotos e la IASA... seguro que muchos seguidores del blog no la conocen. Bromas a parte la CR10.90 tiene una pinta excelente, impresiona!!! Pues no vas mal encaminado. Partiendo de que la CR10.90 es impresionante y casi seguro la mejor máquina del mercado, con esos trigos es sencillo conseguirlo. Tal vez con los trigos de secano que tenemos en La Mancha no sería tan fácil batir el récord. Saludos y muchas gracias por tu comentario. 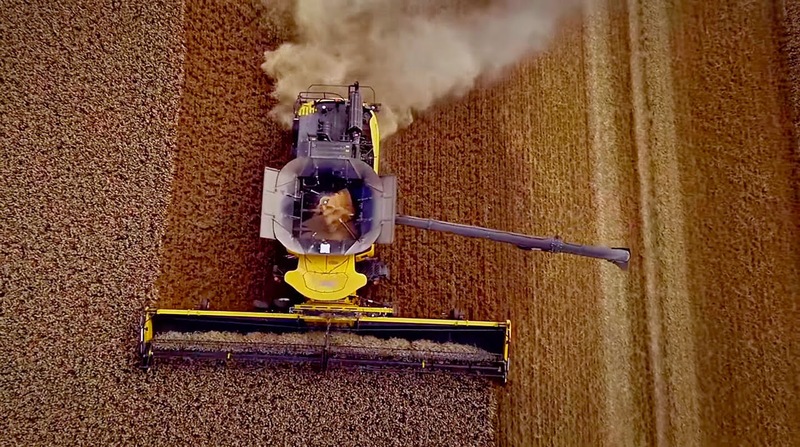 La Volvo S950 eso si es una cosechadora. Hola.... espero que nos envíes fotos para publicar un artículo sobre la cosechadora que comentas y así todos los seguidores la podrán ver. 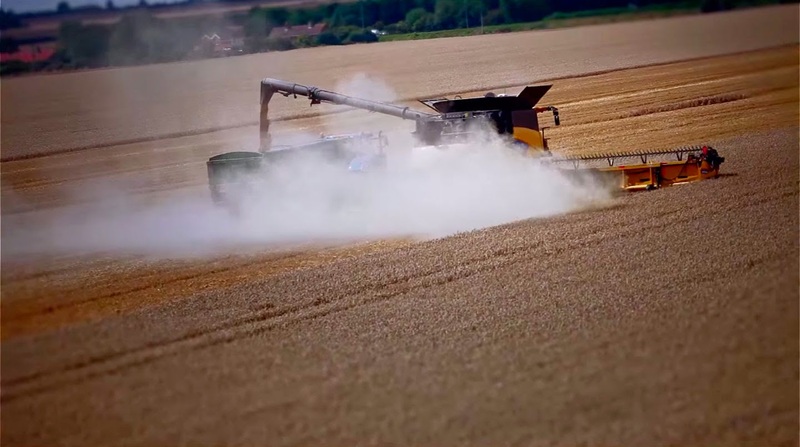 Precision agriculture "Made in Spain"